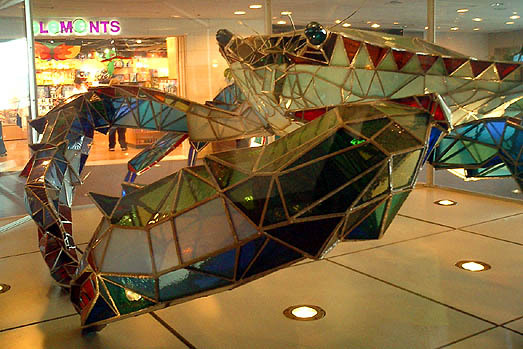 This ten-foot-long stained glass crab lives, it should not surprise you, at Baltimore/Washington International Airport. There is a page about the crab, courtesy of the State of Maryland, which is full of broken images, and there's a joke to be made here about Governor Ehrlich's budget cuts or something but forget it. The page says the glass crab weighs 400 pounds, and contains 5000 pieces of glass. He has apparently been the subject of at least one custody battle, though with a happy ending. The crab's home is in a non-secured part of the airport, which is fortunate for you, because it means you can just drive up there and look at him if you like, without having to have a plane ticket, or having to let airport security staff steal your cherished, engraved butane-jet "retirement lighter" from you, as recently happened to me at LAX. Despite the fact that the list of permitted and prohibited items at the Transportation Security Administration's website specifically says that they are allowable. Bastards. Summary---behemoth glass crab: good; inconsistently applied and seemingly haphazard security rules that make me cry at the airport: bad.